The theme for this Coloring Ball is COEXISTENCE. 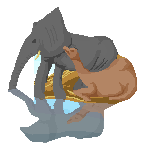 Within the given shape, show coexistence of two (or more) forms of life. In this competition, coexistance means: 'to exist simultaneously within the same shape'. The coexistence doesn't necessarily need to be a peaceful one. Each of the forms of life within the shape can be organic or non-organic. They can be existing forms of life or purely from imagination. After you're done with the drawing, in few words describe your example of coexistence. 1. You can replace the outline with your own colors. 2. All colors are allowed to coexist within the shape. 3. You can scale, rotate, or flip the shape horizontally/vertically. 4. The triangle inside the shape doesn't need to be colored. It's up to you to fill it or leave it empty. 5. Your entries must be in by May 18th. 6. Coexist and have fun! Someone ventured into the wrong cave and returned in coexistence with an alien species. Omnomnom. 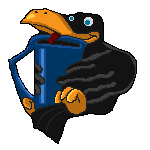 Where-ever Quoth the Raven is, his Big Blue Cup* is never amiss! And that is how they co-exis(t). * Full of delicious coffee, with three sugars. A truce in the Battle of the Sexes. I "pictured" this almost immediately, tried some other things, but kept coming back to this idea. I could have used a few more pixels on the gal's arm, but that's all Kasander gave me. I did try additional shading, but nothing I was able to do seemed to make it a better image, so I called it "done." Edit: Darn it! I think I just made the same mistake here that I made last month. My image doesn't really fit within the shape. Sorry, folks. Guys, these are wonderful! I love how different each one's idea of coexistence is! Yessir, the throphies are polished and waiting for the winners to take! To me it seems there's nothing wrong with your shape, jwalt! And I love your idea, it's very brave of you to fit man and woman in this poor-wanna-be-shape of mine! Honestly, I'm fully convinced. All in all, well done folks! And to the others who are still unsure if they will participate or not: don't be afraid to coexist! Let's keep them coming! There are a three border pixels on the inside of the shape that you colored, but that's all within the rules. Even if it wasn't I'm sure nobody would mind a few pixels outside the shape? If there's couple of pixels outside the outline, and I can't notice them, I won't mind. But rules are rules and let's try not to let your pixels stray, folks! 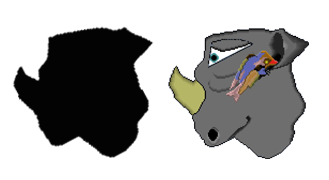 A rhino with an oxpecker on it as an example of coexistence in mutualism. This is not a valid entry, I'm afraid. Rotating the shape, gimp somehow produced lots of clusters of pixels, so I had to redraw it which means it's not the actual shape anymore. But I really liked the topic, so this runs noncompetitive. Such a shame about Gimp misbehaving... I'm working mainly with Photoshop, so I can't help much with other programs. Maybe you should give Paint.net a try someday? It's freeware and I hear some folks from here use it and seem to like it (don't know anything about its cons though). Adrian, if you rotate a pixel outline you are always forced to interpolate. Doing that will either look crappy (nearest neighbor, possibly what happened in Gimp), or introduce anti-aliasing (gray pixels). Either case will look different from the original, so I guess either redrawing the outline or living with anti-aliasing would be the only option. Kasander, what do the rules say about rotating the image in that regard anyway? By the way, I rotated it in Photoshop and it seems Adrian hit the outline very precisely. Just realized I am kind of obsessing about this challenge. Creepy. I also looked at Adrian's image in MSPaint, and I think, if not spot on, it comes very close. MSPaint wouldn't rotate it to that precise angle either. I submit that the image would probably look okay with the head at the angle of a normal rotation, so I think it ought to be allowed. It probably looks better at the angle Adrian chose, but forcing an individual, pixel by pixel, duplication of the outline would create a lot of additional work (and also introduce a distinct possibility of unnoticed errors and eye strain). I confess that I rely on MSPaint to "correctly" rotate and flip the outline, and I don't usually pay all that much attention to how accurately it does the job. Gah, my OCD is acting up again. Hah, right back at you buddy, I counted 10 pixels over the line, go and fix them ASAP! But seriously, this is insane. I couldn't even spot the triangle until I did the overlay. Great job! It's a hermit crabbish creature with carnivorous worms living in its shell. nice one, interesting fill for the shape. Cerno, waheela: And all of a sudden I feel like playing Pokemon again. OHMYGOD! 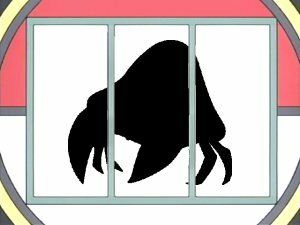 This is going to sound insane, but I totally chose a hermit crab based on the fact that I saw Parasect when I looked at the shape!!! I'm glad the theme works for you folks. @Adrian, Cerno and jwalt are right! 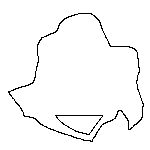 I had checked your shape in PS previously but rotated it only 90 degrees all the way (I did it instinctively, assuming you did the same, because rotating 90 degrees in most graphics programs doesn't cause interpolation/quality loss). So it's no wonder why your rhino didn't seem to fit the starting shape! Now I rotated freely with rotating tool and, obviously, suddenly it clicked! I filled basic shape with black and covered it with rhino - and it's almost a perfect fit to me. I won't fight over these few pixels misplaced by interpolation. IMO, Adrian's rhino doesn't bend the rules at all. After all, the rules doesn't say that one can't rotate the shape freely. Perhaps they should say so in the future, I don't know. That would fix the interpolation issues but at the same time it would took away some of artistic freedom (quite a lot of degrees of freedom actually;)) from the competition. Well, I guess it's up for for the future CB holders to decide. There's still quite a lot of time left, so I look forward to seeing some new examples of coexistence! Thanks for accepting my entry, everyone! That makes me a proud competitor in this game. Coloring Ball is my favorite!